This recipe makes dinner a snap using our Secret Speedy Technique #1: The Sheet Pan. 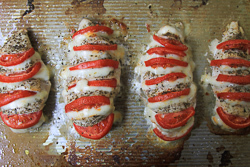 A sheet pan dinner utilizes oven roasting to create healthy dinner options quickly and easily. 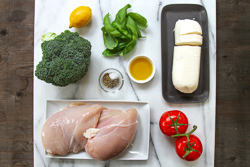 This caprese chicken is juicy and seasoned with fresh lemon juice, then stuffed with fresh mozzarella cheese and tomato slices. Since the broccoli and chicken had slighlty different roasting times, we used a separate sheet pan for the broccoli. 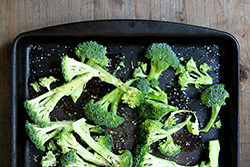 Spread the broccoli out on the pan to ensure that it will roast properly and not simply steam. 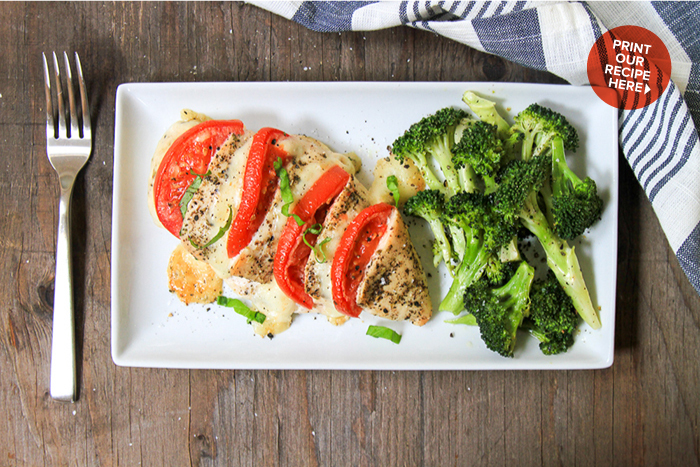 This recipe couldn't be easier to execute, and creates a tasty, colorful, and healthy dinner. 2. 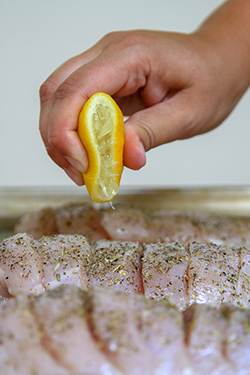 Deeply score the chicken breasts every 1-inch along the top of each breast. 3. Rub the scored chicken breasts with the oregano, Kosher salt, and black pepper. Then drizzle with fresh lemon juice and olive oil. 4. Place a slice of the fresh mozzarella and tomato into each cut of the breast. 5. Add another sprinkling of Kosher salt, black pepper and a final drizzle of olive oil. 6. Bake for 25-30 minutes, or until the internal temperature of the chicken reaches 165 degrees F.
7. 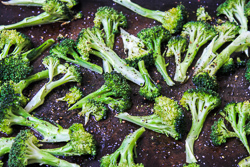 Meanwhile, prepare the broccoli by tossing in olive oil and sprinkling with Kosher salt and black pepper. 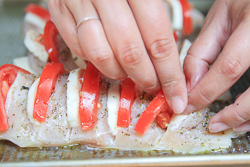 Spread out in a single layer on another sheet pan, and roast in the oven with the chicken for the final 15-20 minutes.